The Bhau Daji Lad museum is part of the City Zoo complex in Mumbai and has an amazing collection of artefacts from the colonial era that include quaint ethnographic depictions of urban life in the metropolis. Its beautifully restored mid-nineteenth century building houses small model portraits of diverse communities that used to make up the ethnic mosaic of the city, and also little models of homes that reflected local housing traditions. Whatever the awkwardness they evoked in generations of city kids who gawked at these exhibits – they did provide a glimpse of how the city functioned then. Besides making them aware of the city seen through the eyes of the authorities. Anthropology as a discipline is historically moored to colonialism, but its practice today has far more creative and critical possibilities – provided it connects with locations, practices and perspectives that align with communities rather than structures of power and governance. Urbanology - our word to describe what we do and the way we do it – is undoubtedly imprinted by the discipline of anthropology that makes up its palimpsest of methodologies - including architecture, planning, art and design amongst others. It is this ethnographic twist that we bring to our practice that has shaped the current ongoing exhibition at the museum – (July 1st to 30th 2017). We were invited by their city museum authorities to exhibit our work in urbz’ home base which really provided a restful pause that our several years of work, taking our exhibits to museums and biennales around the world needed. And what better place than the museum to show case our observations about the special nature of urban life in India – one that is characterised by circular movements of people, one that turns the nature of urban habitats inside out with its constant cross-referencing with rural India, where local residents and builders are active agents of constructing homes, where families lead several lives across vast territories and where the extensive railway network still allows people to move across those vast tracts of space, in an affordable and relatively efficient way. How do we communicate and collectively visualize urban forms that emerge through such processes? The exhibition provided a platform for our previous attempts at doing this as well as an opportunity to experiment with newer ways. Besides, it was also an excellent moment for us to underline our anthropological dimension and play around with the colonial legacy embedded in the older exhibits. So yes – there are models of homes on display, each representing a confluence of artisanal and design skills, made by local builders who conceptualised home designs like architects usually do, and then worked with artisans who translated them into models. Each artisan working with a particular material. However, a small move, like naming each designer and each artisan who made the model, shifts the representative parameters of the exhibit in terms of its colonial ancestors. These are no more nameless abstractions of what communities’ habitats represent as types. They are specific structures with their own historical and cultural textures. If they are part of a larger architectural language – vernacular, Konkan and contemporary at the same time, then this too is clearly represented in the exhibition through a set of architectural drawings and photographs that showcase homes in settlements in Bhandup in Mumbai as well as in the villages of Ratnagiri. Again, representing this as an architectural typology is a universe away from seeing it as part of an ethnic prism. These subtle shifts, that still work within the over all ethnographic flavour of the museum’s legacy are important markers. And then there are the straightforward forms of short films, image streaming off social media, selfies and shared photographs that emerge from the minds of the different families who were part of the study over the past couple of years. Once more these are largely their photographs and stories, their notes and representations inviting the viewers into their worlds. One of the most popular exhibits was the most interactive. 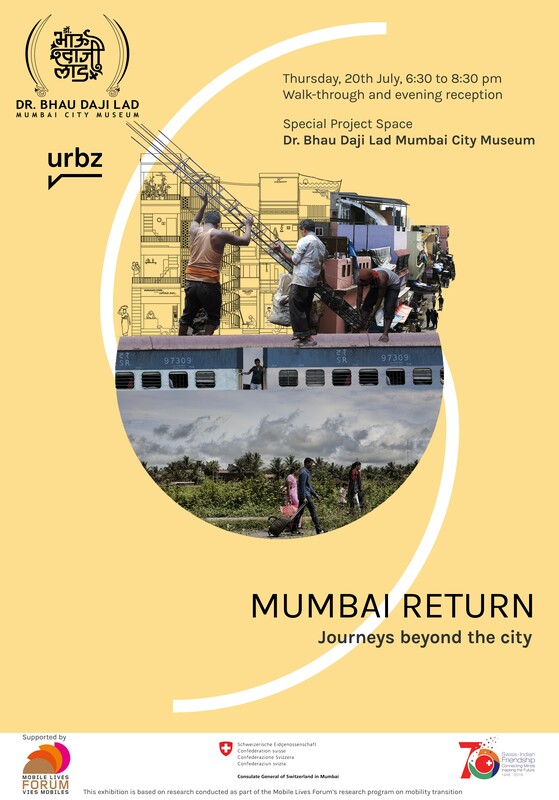 A simple stringing together of locations from ancestral rural or urban roots on a map of India, to the spots where they live in Mumbai, saw most visitors enthusiastically finding their points of reference through a growing maze of colourful strings that gave dynamic shape to the idea of circulatory lives.